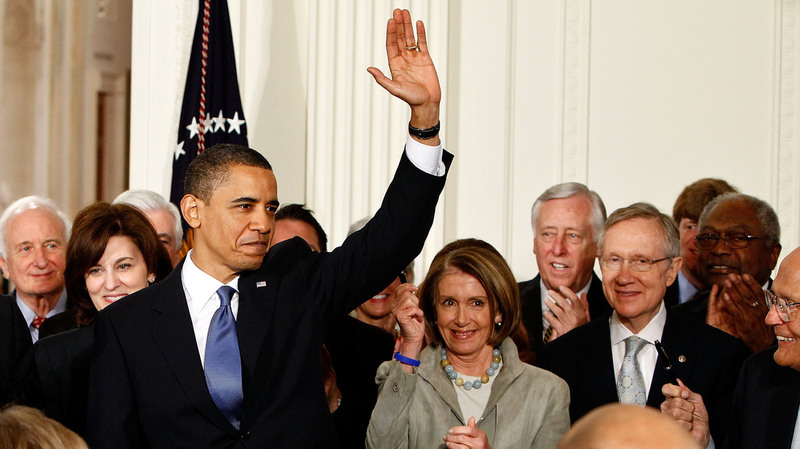 'Tax' Designation That Saved Health Care Law Being Used To Fight Obama : It's All Politics Back when President Obama was urging Congress to pass his health care law, he rejected claims that the penalty for not obtaining insurance would amount to a tax. On Thursday, Chief Justice John Roberts begged to differ — while using the tax classification to save the law. And Republicans pounced. President Obama waves after signing the Affordable Care Act at the White House on March 23, 2010. In 2009, as President Obama was trying to convince Congress to pass his health care legislation, he stridently refused to characterize as a "tax" the penalty that would be imposed for not obtaining insurance under the law's individual mandate. On Thursday, Chief Justice John Roberts begged to differ — while using the tax classification to save Obama's signature domestic accomplishment by a single Supreme Court vote. A Thursday night email from the Republican National Committee offers a "brief history" of what it calls the president's "broken promises on health care taxes" dating to the 2008 campaign — a time when Obama still opposed the whole idea of the individual mandate. And it includes a 2009 appearance on ABC's This Week, when Obama responded to the claim that the mandate would be a tax increase by saying flatly: "That's not true." The Los Angeles Times reports that on Friday, the conservative group Americans for Prosperity launched a $9 million ad campaign that now calls the health care law "one of the largest tax increases in American history." Surrogates for the Obama campaign, in a conference call with reporters on Friday, fought back. "I just want to respond to the latest, frankly, bizarre attack, which is the claim that this act represents a big tax increase on the middle class," Massachusetts Gov. Deval Patrick said. "First, this is a penalty. It's about dealing with the freeloaders, the folks who now get their care without insurance in high-cost emergency room settings. And all the rest of us pay for it today. The estimates are that by bringing those folks into the insurance system and penalizing those who don't come in, we're talking about a penalty on 1, maybe 2 percent of Americans." Patrick also gave a backhanded political compliment to his predecessor, Mitt Romney, architect of the Massachusetts' health care law: "In using a model — the model — for Obamacare, we've reached 99.8 percent of children, 98 percent of our overall population. I don't think there's another state in America that can touch that. We are healthier by any number of measures. The cost of health care has come down on a per capita basis. There are more businesses offering health insurance to their employees today than before health insurance reform went into effect. Folks have all the choices they used to have and more, and we're bringing health care costs down. It has not busted our budget either. Expansion added about 1 percent to state spending. That's Romneycare in Massachusetts, and that will be Obamacare for the rest of the country." Maryland Gov. Martin O'Malley, in the same call, said Romney and some of his backers are "retreating to the last bastion of scoundrels, which is to try to cast this as some sort of tax increase."